As your business develops and gets larger, your need for proper organization and streamlined tasks becomes bigger. You’ll need to set business goals, establish rules, classify teams, define functions and a lot more. There are numerous ways of making these things more manageable. A WordPress intranet is a great way of doing just that. To set up a WordPress intranet, you don’t require another website. You can create both the usual customer-facing website and intranet with the same WordPress intranet theme. Don’t know what that means or where to start? Don’t worry. You have all the information you need from start to finish in this article. What is a WordPress Intranet? How to Setup WordPress Intranet? Stick around, let’s get down to it! An intranet is a private network that is only accessible to you and your employees. People outside your company would not be able to access your intranet. An excellent example of this is creating an internal community or business website that is not accessible to the general public. Why invest in one? An intranet can serve as a private communication channel which you can use to share sensitive business information and news with your employees. Use the intranet to encourage team spirit among employees. Allow users to create profiles and use messaging boards, similar to social networks. An intranet is also an excellent place to internally host business documents and private files: staff documents, contract templates, business policies, codes of conducts, training resources for employees and so on. It can serve as a forum for members of your organization to share ideas or as a testnet website. Publish content privately and ask your staff what they think. Then make appropriate adjustments before posting it to the public site. If you’re running a business with one or two employees, you might not need an intranet. In that case, wait until your company grows a little. Setting up an intranet is best for medium and large scale businesses. Also, an intranet may be a good idea, if you have a business that depends on partnerships and collaborations. A WordPress intranet is, basically, an intranet set up and hosted on the WordPress platform. So, you get all the benefits of WordPress, except, it is private and only accessible to you and your staff. It’s not difficult to maintain, and you’ll have thousands of plugins to choose from. A WordPress Intranet can be part of your WordPress website that you make private primarily to allow sharing of company information and computing resources between employees. With an intranet, a company can restructure everyday activity, categorize people and information, and communicate more efficiently with employees. It gives remote access to company resources and knowledge base, helping employees cooperate as they would do in a standard office environment. An extranet offers the same benefits as an intranet. Additionally, it gives restricted private access to authorized clients, associates, vendors or other chosen individuals or groups not working within the company. Thus, when part of a company intranet’s digital workspace is made accessible to these parties outside the company, that part of the intranet works as an extranet. The primary difference between the two is that intranet allows internal communications between employees or company’s colleagues while the extranet enables the business to communicate with outside parties in a private virtual space. WordPress is not primarily designed as intranet software, but it comes with a lot of features and functionalities that you need to run your intranet efficiently. Choose plugins that suit your business needs. If you are unsure of what steps are required to set up a WordPress intranet site, this guide will walk you through all you need to do. XAMPP or WAMP localhost: Use this if you want users to have access to the intranet only when they are within the company’s physical office space. A hosted WordPress site with Plugins: Use this option when you want users to access the intranet within and outside the local network. You can improve the security of the system with a plugin like All-In-One Intranet. In this guide, we will show you how to how to setup WordPress intranet using two plugins – BuddyPress and the All-in-one-Intranet. We’ll show you how to set up a WordPress intranet with Hostinger’s shared hosting, instead of a dedicated computer. BuddyPress will help to turn your WordPress site to a social website, and the All-In-One-Intranet will help you to lock down the website and restrict access to unauthorized users. All-In-One Intranet offers everything for a functional intranet and restricts access to unauthorized users. The free version includes Privacy features, Login Redirect, Auto Logout and much more. With the free version, you can configure the privacy of the site through the settings tab. However, if you want a lot of support and premium features, and prefer WordPress Multisite, you need to upgrade. For this step, all you need is a WordPress website hosted on a public server. If you don’t have this, set one up and move to the next step. The regular WordPress website serves as the base for your intranet. When the page appears, click Install. Hover your mouse across to the All-In-One Intranet. You will find this when you click on the Settings tab from the WordPress admin dashboard. Once there, click on the Configure button. 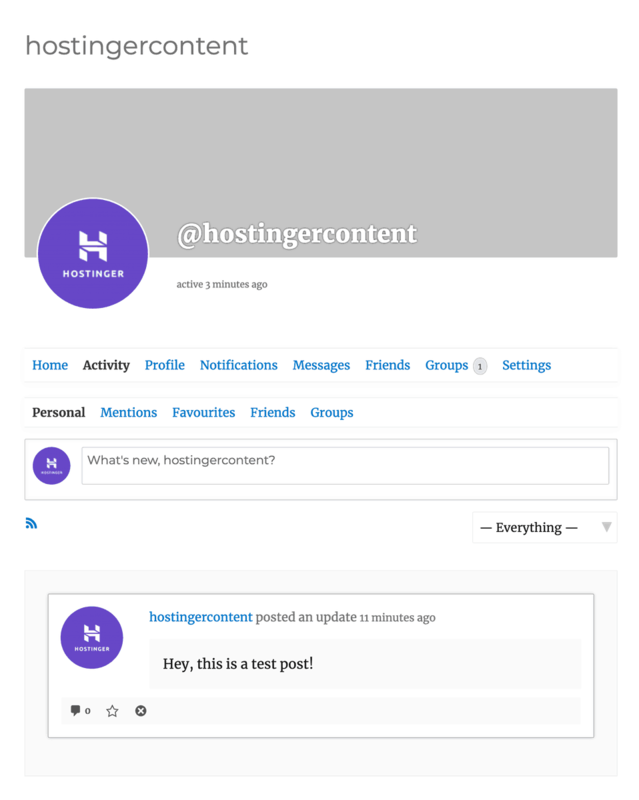 After installing and activating the WordPress plugin, navigate to Settings, then All-In-One Intranet and click on the configure tab to create an intranet. You don’t have to change much in the settings. It is an automated process, and by default, the plugin will start it. The system will inform you if the option Anyone can register is on or off. If it is on, it means the public still has access to your site. If that is the case, turn it off. Alternatively, select the waiting period for inactivity before the system turns the user off. This feature is a security precaution to prevent any unauthorized access when a user by accident leaves the system on a public computer. When you finish creating the WordPress intranet, click save changes to apply the new settings. At this point, if you visit your website you will notice that it is concealed with the default WordPress sign in. Your intranet will function fine without this step. However, you may want to integrate some unique exterior configurations to the front-end of your website. 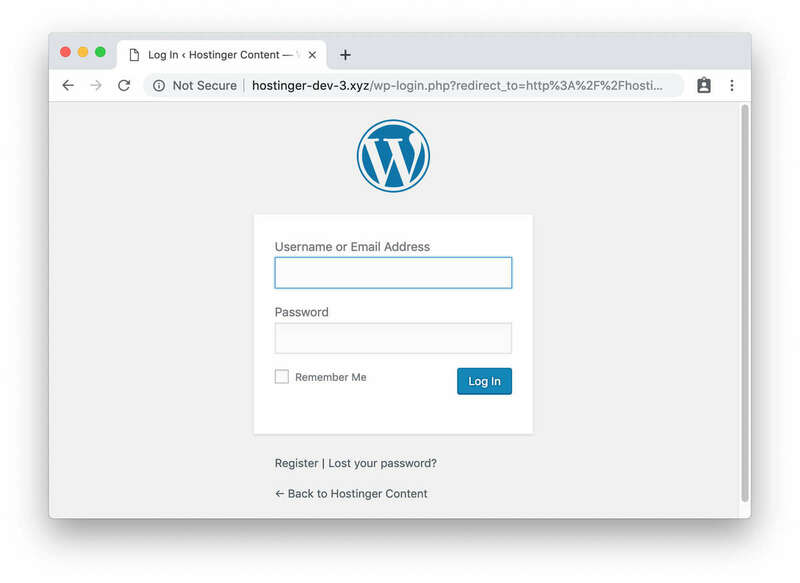 To do this, a plugin like Admin Custom Login can help you alter the look of your WordPress login page. BuddyPress comes with social networks features which make creating user profiles for different employees easy while integrating them into group discussions and instant messaging. 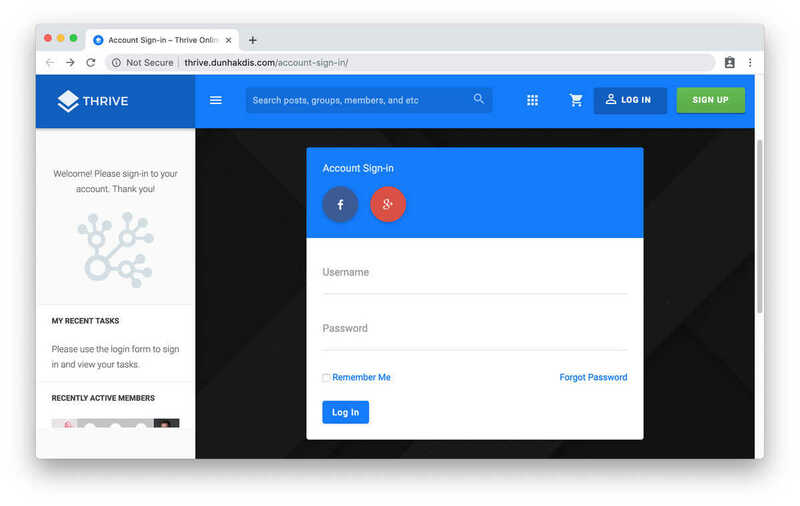 With this plugin, your employees or members can sign up and set up profiles, engage in private conversations and make social interactions with other logged in users. It’s API compatible, meaning it works well with many WordPress themes. 5.6 Version of MySQL and higher versions, or, 10.0 version of MariaDB and higher releases. Editor’s note: All these features are fully supported on all Hostinger hosting plans. Log into the WordPress dashboard, open the Plugins menu and click Add New. Next, navigate to the search field and look up BuddyPress. Click Install Now to begin the installation. After installing and activating, navigate to Settings and click on BuddyPress from the drop-down menu to configure the settings of the plugin. The settings dashboard is classified into various sections. The first section you need to configure is the components page. This page displays the existing BuddyPress components. The pre-set components are suitable for nearly all websites. Nevertheless, you can toggle the box for any element you want to change. Remember to click on the save button to save your settings. Click on Pages to set up your directories and select the pages you want to configure for various BuddyPress site segments. The plugin comes with automated preset pages. You are free to use them or alter them as you wish. If the register and activate tab did not show up on your page, check if you enabled user registration on your WordPress site. Once, you’ve done that, navigate to the Options tab. Lastly, click on the Options tab. Go through the settings and change them according to your needs. By default, some parameters are implemented automatically. After configuring BuddyPress, the setting won’t automatically show up on your website. To add them, visit the Appearance -> Menus and add BuddyPress pages to the menu. After that, click on the save tab to apply the changes. Once, you are done, go back to your website to view BuddyPress. When you click on any of the pages, Groups, Members, Activity, and Register, it will open a BuddyPress page. For instance, click on the activity tab to reveal the happenings of your BuddyPress social network. Here you can post various status updates. BuddyPress plugin is compatible with most WordPress themes. Besides, it has in-built templates you can use if your theme lacks ones compatible with BuddyPress. WordPress is not designed as intranet software. Thus, a regular WordPress theme might not work for creating intranet projects. There are unique themes developed to serve the purpose tho. These premade themes offer the main features you need to get your intranet up and running out of the box. The majority of these support plugin integration for BuddyPress which helps set up user profiles and, save activity feeds, while offering an excellent social networking experience. These themes ensure a secure environment for private companies and their information. You’ll get functionality similar to Facebook’s making it easy for your users to communicate, network and interact with other members in a secure environment. These themes are customizable too, helping enable the features you need and disable others not relevant for your project. These WordPress themes make it easier and more cost-effective to set up and run a professional WordPress intranet. Have a look at our five favorite handpicked options. Woffice is packed with many useful features and can be adapted for a lot of uses. Configured out of the box as an employee portal, it features an easily customizable design with a contemporary look and feel. The theme comes with a user-friendly UI similar to that of Google’s Material design. You can easily customize the login page, manage files, use the event calendar and use it as an ecommerce site. It can also be adapted for a company’s intranet or extranet site. Woffice also serves as a government Intranet site and works great for NGOs and charities. It is easy to install, thanks to the two demos. The login page is an adaptable and optional feature that improves the security of your private files. The Woffice control panel makes it easy for users to access relevant information. It is supported by WordPress 5.0+ and BuddyPress 4.0+. 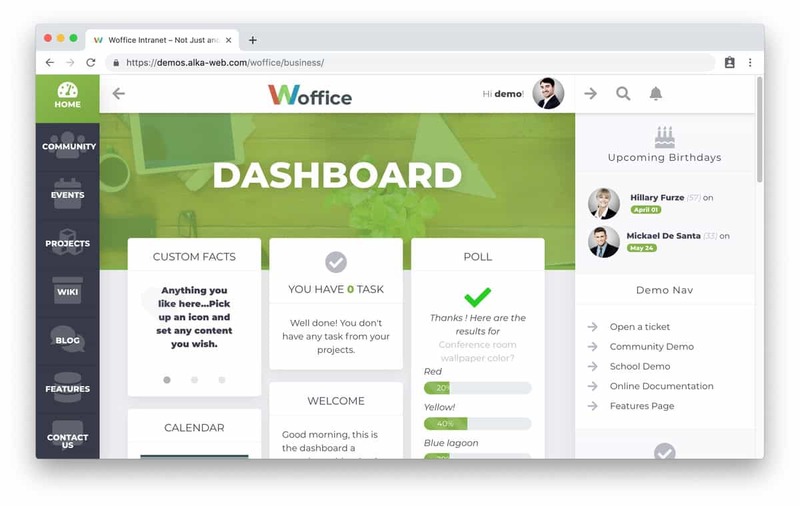 Woffice lets you publish content on the private intranet, create and manage multiple accounts, and send instant messages to other users. The bbPress and BuddyPress plugins for Woffice help convert your WordPress intranet into a social network, adapting the functionality to suit your needs. Thrive WordPress themes help you to set up your company’s intranet or online community website. Thrive’s primary demo features an attractive stylish and contemporary design. Thrive comes with an illustrative drag-and-drop website building tool. This feature makes it easy for you to adapt the pre-set demos and designs suit your business or company’s needs. You enjoy all the fantastic features of this WordPress intranet theme when you pay $67 for the standard license. The range of communication tools that comes with this theme provides your intranet users or online community with many desirable features. It is compatible with the BuddyPress WordPress plugin, making it easy for users to set up their profiles to connect with other users. Users can send messages, use internal knowledge bases, share timelines information, and upload images. It also supports file sharing and Live Chat with complete control features. Thrive gives you multiple options if you need to publish content within your intranet. You can either use the blogging tools or in-built wiki and resource base to post your content depending on the format that suits your organization. Thrive also gives you privacy tools to ensure your files stay safe. It also has a user-friendly and engaging event calendar. Due to its numerous features and easy integration, Thrive is a favorite self-hosted social networking tool and one of the preferred themes for creating a WordPress intranet or extranet. BuddyApp is an interactive, mobile-friendly WordPress intranet theme. This is one of the best solutions for people who want to build an intranet that can be accessed on the go. 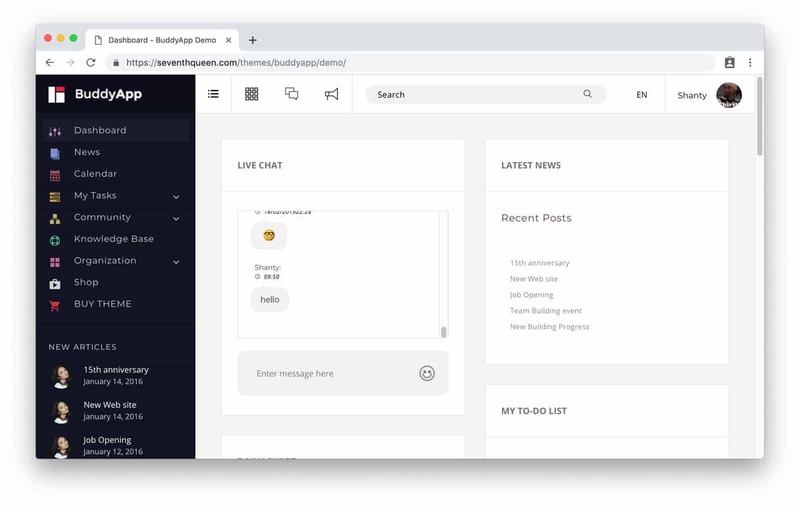 It comes with live notifications, real-time access to messages, and an Ajax live search to help find content easily. Ajax live chat enables instant messaging between users, while the discussion forum makes it easy for users to create forum posts and responses. You can also allow Facebook Signup! Moreso, BuddyApp features a social network and interactive tools like activity feedback, user profiles and rtMedia galleries for uploading pictures, creating albums, and hosting video. It also has the option of advanced file uploading and management together with an events planner. The design is completely customizable. You can customize it using the many options available. The Visual page Composer feature makes this task easy and quick. Moreover, the gallery allows adding albums, photos, audio, video encoding, and more. And all of these fantastic features cost $49. If you want 12 months of extended support, you will need to pay an additional $13.88. 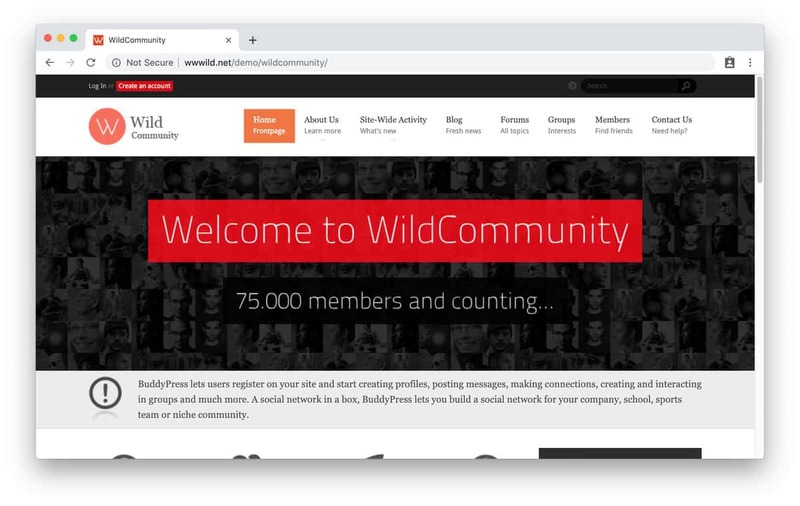 The WildCommunity theme is included in the BuddyPress plugin and allows users to sign up and create individual profiles, post messages, collaborate with other users, create groups and communicate at will with group users. It works more like a social media platform, allowing to create your company’s social network. It comes with excellent practical features and smart design. You get complete integration for bbPress, many inner panels including group pages, forums, and user panels. It is excellent for both intranets and extranets. The theme is customizable and comes with Event planners and the rtMedia gallery. Live Chat enables instant messaging between users. It comes in a responsive layout, being compatible with both BuddyPress, Forum Editor, and WooCommerce extensions. For the regular license, you need to pay $49. However, if you want an extended license to enable you or a single client use it with an end-product that would charge users, you’ll need to pay $2100 covering both the cost of the theme and the purchaser’s charge. 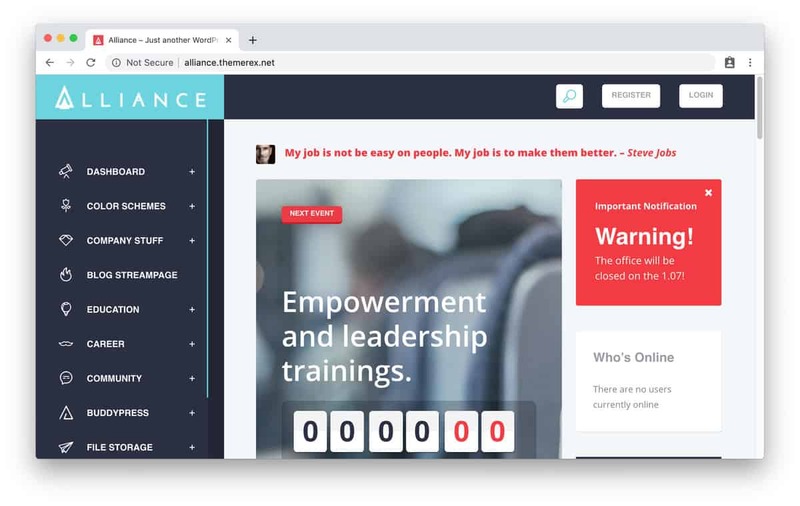 Alliance is a great, responsive WordPress intranet theme. Like the WildCommunity, it is suitable for intranet projects and extranet sites. The one-click importer allows you to set-up a WordPress intranet quickly and integrate all the features required for an efficient site. It lets you set up permissions, giving or restricting access to users. Bulk imports hasten and simplify access to users. Alliance comes in an attractive contemporary design with clean and flat visuals and compatible Grid plugins. It is mobile friendly allowing access to the site when out-and-about easily. The control panel lets users have an immediate overview of the most up-to-date news. The users on login instantly view their notifications like new messages. They can also track the activities of other users and upload or access files in a secure environment. Other practical features of Alliance include courses and resources. The quiz tool makes examinations and assessment of new employees easy. The theme allows customizing the dashboard to suit your needs. You can choose from three website panels and make changes with the easy to use Visual Composer page builder tool. The standard license costs $59, and if you are interested in extended support, you need to pay an additional $17.63. What an Intranet is and why you need one for your business. We showed the easiest way to build it – WordPress. Now you know how intranets and extranets are different, and how to make your very own with just a few WordPress plugins. Additionally, we presented our five favorite WordPress intranet themes that add valuable features and will make your project shine. You now have all the information needed to start your very own WordPress intranet. This can be an excellent solution for a medium-sized business, to make their team more efficient. You just need two plugins, a bit of customization and tweaking to create a private communication network that ensures your business functions smoothly. With your intranet set up, you can easily share docs, build teams, leave feedback or notification for future projects and much more. With the BuddyPress plugin, add more functionality and community features into your intranet and lock away access from unwanted eyes. These two plugins create a fully operational and secure intranet to make all workplace collaboration more reliable. Have more questions? Want to share your setup? Drop a line in the comments below!